Home ice cream How To Make Homemade Peach Ice Cream Ice Cream Maker? How To Make Homemade Peach Ice Cream Ice Cream Maker? 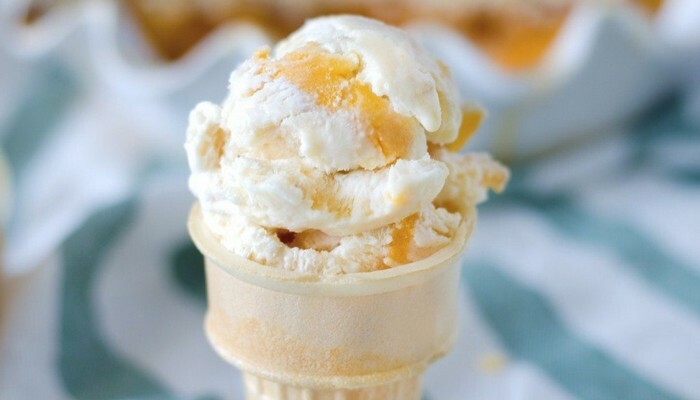 This delicious homemade peach ice cream is loaded with a peach flavor! Add a vanilla bean and you have a great summer dessert. The best part of this peach ice cream recipe is that it is very simple and reasonably fail safe. I have done it many times and it has never disappointed me. Last Saturday we went to a farmers market and got 2 half peach ventilation gas. They are very mature at this time of the year and do not last long, so most are rinsed, quarter cut and frozen for the winter. They are perfect for homemade peach ice cream. What makes this recipe simple and fail safe is the use of corn starch and milk powder as thickener and stabilizer, making it easier to work with cream stabilizers. I use pureed peaches in this special ice cream recipe, but it is not really important; You can choose to dice or even cut. If you want the peach pieces to have a small texture, add the peaches into cubes. Another option is to use half peaches and half dice. To ensure that the ice does not get too soft after adding the peach puree, you can put it in the freezer for 20-25 minutes while the milk mixture is frozen in the ice cream maker. You will notice some softening, but that does not affect the texture. Put the ice from the ice machine in a container and put it in the freezer for at least two hours before serving. So, how does this ice cream relate to an ice cream? It tastes absolutely lighter and less fat, but it still has a nice body and a velvety feel in the mouth. It is a clear winner in my book. The only drawback is that you probably want to eat more because it tastes easier. Is that really an inconvenience? Scrape the seeds from the vanilla pods with a few knives. Combine sugar, vanilla seeds and milk powder in a medium-sized pan. Add 2 cups of milk with constant stirring. Add the bean pods to the milk. Prepare the cornstarch by combining it with the remaining half cup of milk. Beat until the cornstarch and the milk are mixed and no lumps remain. Bring the milk slowly to the boil, add cornflour and stir constantly, scrape the bottom with a heat resistant spatula until the mixture is thick enough to cover the spatula, about 1-2 minutes. Remove from the fire. Install an ice bath by placing a 2 liter container in a large container, partly filled with ice and water. Place a sieve over the top of the smaller container and pour the mixture into the container. Cover and allow to cool to room temperature. Gradually add thick cream, keep stirring constantly, cover and cool overnight or longer (maximum two days). If you like light and airy ice cream, beat the thick cream until you see soft peaks and then combine it with the milk mixture. Freeze the mixture in your ice cream maker according to the manufacturer's instructions and add peach puree about 5 minutes before freezing. Bring the finished ice from the container to put ice in a container and freeze it for at least two hours before serving. If the ice freezes over night or longer, leave it at room temperature for about 20 minutes before removing it. Shake the ice cream until it looks soft and then add your chunks or puree of fresh fruit. Let it harden (if you can wait) and serve with some extra fresh peaches. This peach ice is exclusive summer and reminds me that I was at school in this small peach orchard in the middle of nowhere. 1. Pour cream and milk into a saucepan over medium heat. 2. Add the sugar and stir until the sugar has melted. 3. Beat egg yolk in a separate bowl until it turns yellow. 4. Slowly pour one or two pans of milk mixture into the egg yolk, stirring constantly to prevent the eggs from fluttering. 5. After you have tempered the egg yolks, add the egg mixture with the milk to the pan. Turn medium-low and continue stirring until the mixture thickens enough to cover the back of a spoon (about 8 to 10 minutes). 6. Add the vanilla extract and mix the mixture through a fine-mesh sieve. Throw away everything that is still in the sieve. 7. Pour the ice cream base into a container and cool until it cools down, preferably at night. 8. Adjust the ice maker according to your instructions and start striking the ice. 9. As soon as the base of the ice cream starts to look like a soft serve, add the peach pieces or puree and let it mix for another 2-3 minutes. 10. Place the mixture in an airtight container and place it in the freezer until it has hardened.